Saturday October 8th 1898 I got the work about done before Pink came back. We had very early dinner and Will took me up town. we went over home and Hattie went with me to the reception at Mrs Remleys. Mary Briggs came down with Mollie Stevens. I had a letter from Moorehead today in which he say he had had a man looking at the Dwight property and thinks he came make a trade for the Delavan property. I let Pink go home tonight after the wash was done up. Will and I went down to John Mc-- t spend the evening. 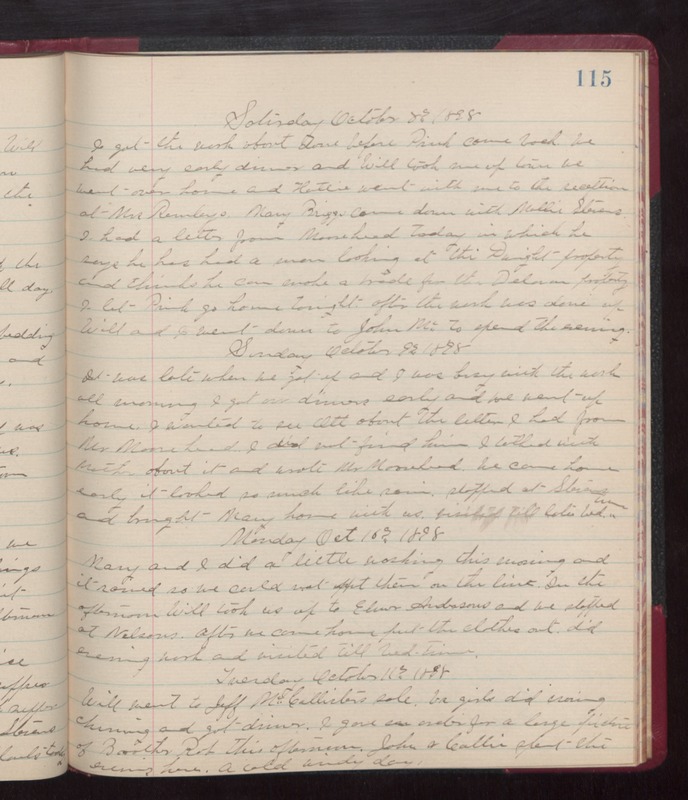 Sunday October 9th 1898 It was late when we got up and I was busy with the work all morning. I got our dinners early and we went up home. I wanted to see Ott about the letter I had from Mr Moorehead. I did not fine him. I talked with Mother about it and wrote Mr Moorehead. We came home early it looked so much like rain. stopped at Stevens and brought Mary home with us. Visited till late bed time, Monday october 10th 1898 Mary and I did a little washing this morning and it rained so we could not put them on the line. In the afternoon Will took up up to Elmer Andersons and we stopped at Nelsons. After we came home put the clothes out. Did evening work and visited till bed-time. Tuesday October 11th 1898 Will went to Jeff McCallisters sale. Us girls did ironing churning and got dinner. I gave an order for a large picture of Brother Rob this afternoon. John & Callie spent the evening here. A cold windy day.